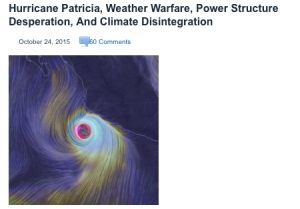 ← Hurricane Patricia Fueled By HAARP? Hurricane “Patricia” is only the latest glaring example of the power structure’s manipulation of Earth’s rapidly unraveling climate system. Hurricane manipulation has long since been “business as usual” for the massive global climate engineering infrastructure. 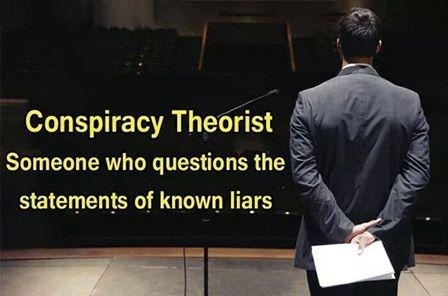 Historical documents prove the reality of the ongoing total government involvement with climate engineering, this includes extensive congressional reports. Though early efforts to manipulate hurricanes were disclosed, such programs have long since gone under the radar. Even “gag orders” have now been placed on government weather agencies like NWS and NOAA. Weather warfare is the weapon of choice for the global power brokers, this weapon is used to keep non-submissive countries in line. Hurricane Patricia exploded with an unprecedented increase in intensity that was so rapid computer models could not even follow it, completely “stumping scientists”. Hey Kymber, Thanks for re-posting!